In our previous article, we introduced a model to help describe the lifecycle of information after it has been disclosed to an organization by an individual. 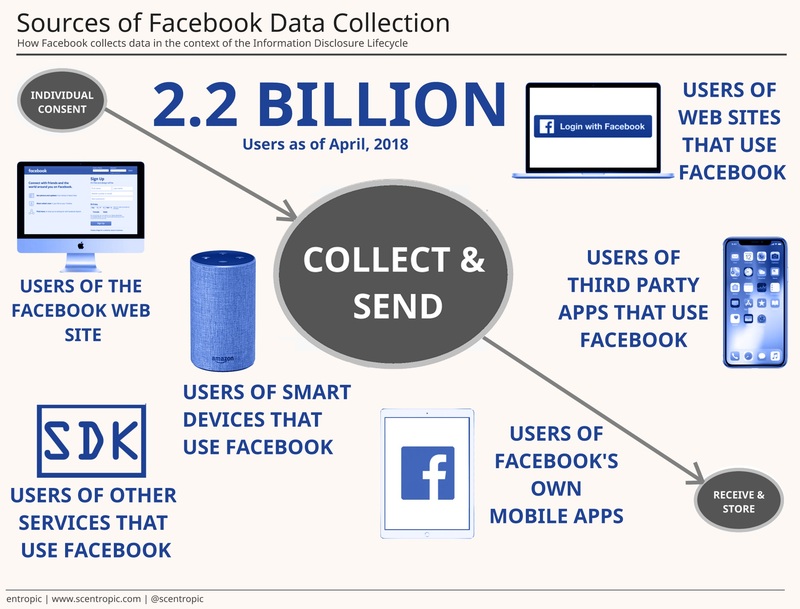 In this article we'll focus on one particular phase of this lifecycle - the Collect & Send phase, and describe how it applies to Facebook. When you think of how users interact with Facebook, you might picture someone using an app on their phone, or a browser on their PC to interact with the social network. However, over the years through third party integrations, company acquisitions, and the evolution of the Facebook Platform, the number of products and services they now offer, along with the volume of information that they collect from their users, has massively increased. In terms of information collection, Facebook is not only fueled by individuals who use their web site and mobile apps, which includes the acquisitions they have made, such as Instagram and WhatsApp. Information is also gathered from a very large ecosystem of third party developers who create web sites, Apps and smart (IoT) devices using elements of the Facebook Platform. Facebook now has at least 24 of their own Apps available across the App Store and Google Play. These include Individual and Workplace Messaging Apps, Media Capture/Modification/Sharing Apps, Recommendations Apps, and Ad and Analytics Managers. Third party Apps developed using the Facebook Platform, such as ones for mobile and Facebook itself, now number in the hundreds of thousands. There is also a vast number of Web sites out there that offer some type of simple linkage to Facebook features such as Facebook Login, Like or Sharing. Smart (IoT) devices which include home entertainment systems, kitchen and laundry appliances, intelligent assistants, home security and monitoring devices, and health monitoring devices, also use elements of the Facebook Platform to allow users to interact with Facebook. Smart devices that use the Facebook Platform empower the collection of users and their household information on a 24x7 basis, where in the past this type of information collection was done based on less frequent, more specific events only. The more frequently products and services access and use the Facebook Platform, the more they disclose information about people and their lifestyles back to Facebook. This multi-faceted approach to information collection is not unique to Facebook. Companies that offer many of their services for free, need to generate revenue based on monetizing information shared by individuals - hence the broad outreach of information collection. Based on events that have recently impacted people's privacy, along with the national security of countries which includes the US, this centralized dependency on information is overdue for a disruption. Blockchain technology is a foundational frontrunner for this disruption, as described in this article by Alex Moskov, originally posted on CoinCentral.com. Illustrated below is a high level view of one phase of the Information Disclosure Lifecycle that we introduced in our last article. Specifically, we focus on the Collect & Send phase, and show the different possible sources of information in this phase, that fuel Facebook. By interacting with the Facebook web site, users disclose information about themselves to Facebook. Some well known examples are posting content and pictures, liking and commenting on posts. Facebook also provides specific services, such as Marketplace which allows the buying and selling of items on Facebook. While using the web site, Facebook is able to collect information about you through your web browser, such as your current physical location, your time zone, your browser and operating system. Many web sites, such as Pinterest include a feature provided by the Facebook Platform that allows their users to Login with Facebook. They can also include features that allow their users to like, share, comment on content, and embed videos, posts, and comments. While using Facebook features on these third party web sites, Facebook is also able to collect information about you from your web browser, such as your current physical location, your time zone, your browser and operating system. Mobile Apps can include a feature provided by the Facebook Platform that allows their users to Login with Facebook. They can also include features that allow their users to like, share, comment on content, and embed videos, posts, and comments. While using Facebook features on a third party App, Facebook is able to collect information about you from your mobile device, such as your current physical location, your time zone, your browser and operating system. This collection can occur even when the App is not running. Being highly flexible, the Facebook Platform can be integrated by just about any type of smart (IoT) device manufacturer, allowing users to like, share, comment on content, and embed videos, posts, and comments. This benefits Facebook by allowing them to stream information about users and their household activities 24x7 back to Facebook, vs. just at specific times of the day. Depending on the capabilities of the smart device, it is possible to collect information from a device's cameras, microphones, temperature sensors, motion sensors, and health sensors. This might include information about when users are at home, what time they go to bed and wake up, physical GPS location, time zone, health related metrics, and more. Smart Watches that support Google Wear OS and Apple watchOS allow users to interact from their smart watch, through apps such as the Facebook app, and Facebook Messenger. Intelligent assistant devices, such as the Amazon Echo, Echo Dot, Echo Dot Kids Edition, Echo Plus, Echo Spot, Echo Show, and Echo Look include skills that can be installed through the Amazon Alexa platform. These skills include features that allow users to vocally interact with their Facebook account through their Amazon Echo device. Google Home also provides users with the capability to vocally interact with Facebook through an IFTTT (If This Then That) Applet. The Facebook Video for TV app is available on several popular Smart TVs, including Samsung, and Sony via Android TV. It's also available on Digital Media Player (DMP) devices, including Apple TV, Amazon Fire TV, and Nvidia Shield TV allowing users to interact with Facebook videos from their TV. Gaming devices include Facebook capabilities. The Nintendo Wii U gaming system allows users to post gaming pictures and interact with Facebook using the Image Share service. In addition, the Nintendo Switch enhances Facebook integration by suggesting Facebook friends and providing friend suggestions. The Xbox One gaming system now includes the Facebook Video for TV app, along with the previously mentioned Nvidia Shield TV. Automobile manufacturers are now increasingly providing Facebook capabilities through their onboard infotainment systems. One of the earliest Facebook apps was provided by the Mercedes Benz proprietary mbrace infotainment system. The proprietary Toyota Entune infotainment system includes the Facebook Places App, which allows you to check-in and notify your friends of your location in Facebook, when arriving. Since the advent of Apple CarPlay and Android Auto, the delivery of apps such as Facebook Messenger that allows calls from infotainment systems, was made easier and safer, and is helping to broaden the use of Facebook and other apps from vehicles. Facebook currently develops and maintains over 24 apps across the Apple App Store and Google Play. At the time of writing, these apps include - Facebook - Instagram - Messenger - WhatsApp - Facebook Creator - Moments - Messenger Kids - Facebook Analytics - Selfied for Messenger - Pages Manager - Sound Clips for Messenger - Shout for Messenger - Layout from Instagram - Facebook Local - Facebook Ads Manager - Strobe for Messenger - Facebook Candidates - Hyperlapse from Instagram - Workplace Chat by Facebook - Workplace by Facebook - AR Studio Player - F8 Developer Conference - Origami Live and MSQRD. The flexibility of the Facebook Platform allows it to be integrated from almost any product or service that chooses to use it. It's important to note that the picture we have just discussed is not exhaustive. Facebook has an extremely elaborate information collection infrastructure that has evolved over a period of more than 14 years. Additionally, our view is through a lens based on how Facebook collects information. We could also look at information collection through another lens, such as Google or Twitter which might yield an equally or more elaborate ecosystem of information collection, with overlaps to Facebook and many other organizations.